I want to take an (animated) 2-d sprite and apply a texture to it. Basically, I want every non-transparent pixel to be covered by the texture (color is disregarded). I understand I can probably accomplish this using masks but I am worried that may not be the most performant solution. I know you can put textures onto 3-d models, so I was wondering if there was a similar process for 2d sprites. Below I have a graphic demonstrating what I want. I see there is an option to add a material to a sprite, so I tried creating various materials. I figured sprites probably expect sprite materials, so I tried creating one. However, there does not appear to be anywhere to upload an image to use as a texture. This appears to only be useful for adding tints to sprites. You need to create a custom shader. The following examples are made in Unity's node based shader creation tool called Shader Graph. You need to multiply the alpha output of your character texture (you need only to where it is) with your desired material. If you'd like to understand the operations with texture this site cover some material which is applicable in Unity too. However, there does not appear to be anywhere to upload an image to use as a texture. This appears to only be useful for adding tints to sprites. 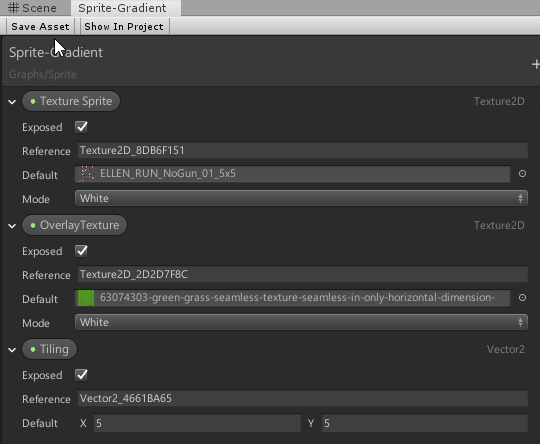 You can have properties in the shader and exposed to the inspector and edit the via script(s). In ShaderGraph you can convert variables to properties, which you can see in the "Blackboard" and assign default values as well as expose them to the editor. 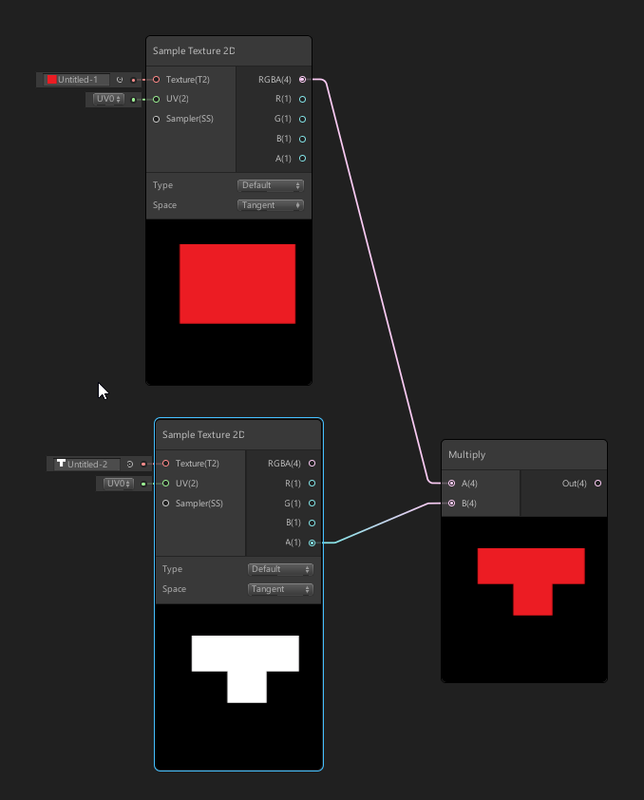 I decided to give a basic example of the shader, created in the Shader Graph tool created by Unity. The source project is the official ShaderGraph Example Library published by Unity Technologies on their Github repository. The sprite I applied the shader on is the "ELLEN_RUN_NoGun_01_5x5_0" asset. The grass texture sample is a random seamless texture found on google (I don't own any rights for it). The target sprite (collection) from the official assets provided with the project (size: 1975x2260) . After we imported these assets it's time to created the graph. First we need to sample both sprites (passed in as properties). To our custom material we add the tiling and offset we think it is the best. Then we multiply it with the alpha of our character (we only need the pixels we can see) and put the result into the Albedo channel of the PBR Master Node. We leave the rest of the values on their defaults (*change the "Surface" property in the PBR settings to Opaque) except the Alpha which is going to be "0", because we don't want to see any pixel that is clipped, if the alpha is "1", every "clipped" pixel is just black. The Aplha clip treshold gets the inversed "pixels" of the aplha value, because we'd like to define the area the should be clipped (every pixel with the value of 1 or below should be cliped, but with an alpha value of 0, we tell that anyhing with that value shoud not be clipped). Not the answer you're looking for? Browse other questions tagged unity textures sprites graphics or ask your own question. How do I apply pixel shader to specific sprite in XNA 4.0 in a spritesort FrontToBack?